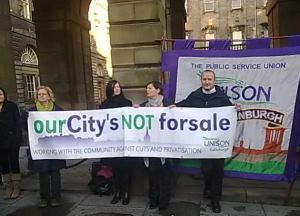 Members of UNISON’s Edinburgh branch will lobby the City of Edinburgh Council Budget Meeting at the City Chambers, High Street, Edinburgh on Thursday 10 February 2011 from 08.30 – 9.30 to urge the council to protect front line services, avoid compulsory redundancies and abandon ‘wasteful’ privatisation plans. The union has produced a briefing for councillors urging them to look at new ways of generating income in light of central government cuts and to consider a ‘living wage’ to protect the lowest paid workers. John Stevenson, UNISON Edinburgh Branch President, said: “We know from the economists who actually predicted the crash that cuts like these are not needed and they are likely to damage the economy further. The UK Government cut £6 billion from public services in June and now we hear bankers are to give themselves the same £6 billion in bonuses this year. Surely something is sadly wrong when public services and public service workers have to pay for the folly of the financial sector. Agnes Petkevicius, Branch Secretary, highlighted the human cost of cuts: “Council services are relied on by the elderly; disabled people; children: Essential services delivered directly by people like home carers, social care workers, classroom assistants, nursery nurses. Often the lowest paid and least valued. Services like roads, public safety, cleansing are relied on by everyone in Edinburgh – jobs delivered for Edinburgh people by Edinburgh people. People who put around 70p of every pound they earn back into the local economy. Calling for the council to avoid compulsory redundancies, Kevin Duguid said, “Unions will work with the Council but that is hard for workers to do when they could be forced on to the dole. Many are toiling to cover for the hundreds of jobs already lost without also being faced with the sack. A Council this size should be able to manage any job losses on a voluntary basis”.